Expressive, innovative and dynamic, this musical collection is a relaxing slow down to the excitement of the Christmas holidays. The Equanimous Jones Quartet was conceived and molded by their leader and mentor, Mr. Equanimous Jones. The musicians assembled for this enterprise have several years of experience performing R&B, contemporary and traditional jazz, as well as composing, arranging and producing original music. 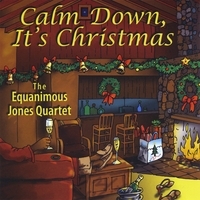 The group's debut cd, "Calm Down, It's Christmas" is a unique collection of holiday music - varied and innovative expressions of the traditional holiday season. There's something for everyone on this cd - jazz, blues, classical, country - songs for distinguished tastes, and music that will liven up any holiday celebration. Cool, very cool! This is exactly the type of music to chill you out and put you into the Christmas spirit. Absolutely perfect for a classy Christmas cocktail party with classy friends, or something to listen to late at night on Christmas eve while trying to put together the new train set or bicycle before sunrise. Your frustrations will ease away! I like everything but "We Five Kings","Santa Claus Is Coming to Town (alternate)" and Christmas Time Is Here are probably my favorites.